A nod of appreciation to bevcraigwhite@Flickr from southwestern Ontario, Canada for contributing today’s image (original image | BPotD Flickr Group Pool). Thank you! The common name of this fungus in Chinese, lingzhi, means “herb of spiritual potency” (lingzhi on Wikipedia). It has been used for millenia in Chinese herbal medicine, while Western medicide has yet to satisfy its need for proof about the claims for lingzhi’s efficacy. 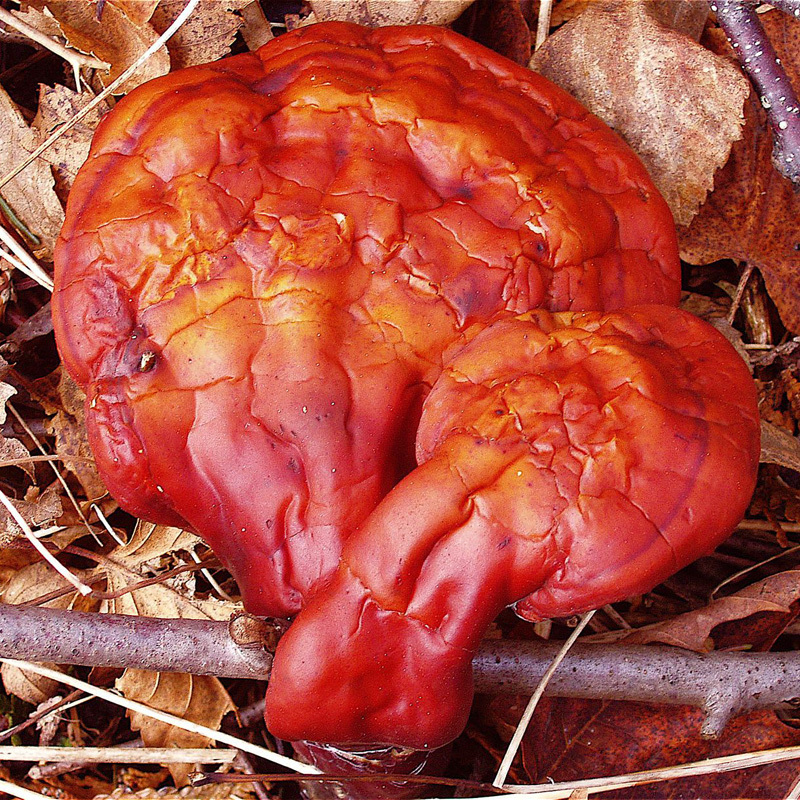 Efforts to examine the science behind the claims are aptly detailed in both the linked Wikipedia entry and this Fungus of the Month article by Kathleen Engelbrecht and Tom Volk. Do read the Fungus of the Month article for more on this storied fungus. On the topic of fungi and fungus of the month, January 2007 is the tenth anniversary of Fungus of the Month – if you’ve ever spent some time reading and learning from Fungus of the Month, I suspect it would be well-received if you sent Dr. Volk a note of appreciation (his email address appears on most pages of his site). Yeah! but is it good to eat? Is there a good source where one can learn the correct pronounciation of plant names? Thanks! Al, no, not edible – too tough to eat. Janet, Tom Volk includes audio files of name pronunciation for many of his featured fungi on the respective pages. If you visit the tree profile pages on Virginia Tech’s Dendrology site, they also include similar help. Beyond that, though, I’m not aware of too much. People can quite vehemently disagree about Latin pronunciation, though. Dave – sure, but I’d prefer it be posted to the Flickr site or the UBC BG forums. My inbox has over 200 emails right now with various “to-dos”. A beautiful group! These are also known/said to be the oldest cultivated fungi in the world! The Chinese have been growing/harvesting these for thousands of years for medicinal teas…. i appreciate the good work of this plant. i would also suggest that in preparing it for herbal use,there should be no sugar in it so that diabetics can use it without fear.